Next litter expected in May. A few of the beagles have been bred and we expect puppies in May. The price for a pup is $1500. We are accepting $500, non-refundable deposits that save a pup for you, with the remainder due when a pup is ready to go to your home. You can follow us on FaceBook at Jackpot & Kingsbury Hounds and email jackpotkennels@outlook.com or call 770-513-7959. Want to know more about our pups? Scroll down on this page for details. We’ve been showing and breeding beagles to show for over twenty years. Pups we choose not to show are available as pets. On arrival at their new home, Jackpot pups have two sets of shots, and a micro chip. Pups are registered with the AKC (limited/non-breeding contract). See our Facebook site for testimonials and photos, posted by proud owners of our pups. Beagle puppy pets cost $1500. Non-refundable deposit of $500 (applied to the $1500 total) reserves a pup for you. We ship in the USA – we only ask the actual cost of airline fees, crate, and health certificate (budget about $400.) Outside the USA, please contact us for arrangements. 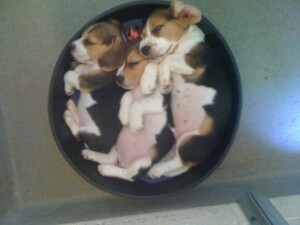 Yes – tri-color beagles are born black and white as shown above. Fur that is white at birth, stays white. Fur that is black at birth may fade to brown. You can see the mother in the photo above is black white, and brown, just as her puppies will be. 13″ and 15″ beagles are born into the same litters. We can hazard a guess but can’t guarantee at 9 weeks whether a pup will stay under 13″ tall or go a trifle over – and a beagle measuring over 13″ at the shoulder (‘withers’) is considered a 15″ beagle. After pups are 5 weeks old we welcome visits to our kennel (by appointment). Pups will go to homes no earlier than nine weeks old. 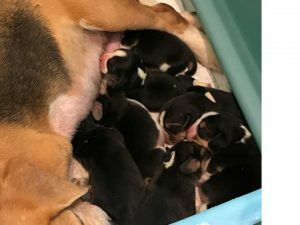 Scroll below to see photos of pups as they grow or see Beagle Pictures on the Jackpot Kingsbury Facebook page.